Leading American manufacturer Glaro Inc. announces new innovative line of platform trucks built to outperform other carts and trucks on the market. Glaro’s new platform trucks are competitively priced workhorse machines with superior decorative features. They are ready to ship in one to three days. This month, Glaro Inc., a leading American manufacturer, announces a completely new line of competitively priced platform trucks. Glaro Inc. carefully developed the new line of platform trucks over two years in order to make significant improvements over other products on the market today. According to executives, the latest iteration of Glaro Glider carts are tough, rugged, “workhorse” platform trucks designed to operate on the same high level as the well-known line of Glaro Glider bellman carts while outperforming the standard platform trucks currently on the market. In fact, many of the new features include innovations never before seen on platform trucks designed for use indoors and outdoors. All new platform carts come standard with heavy duty 1.5 inch diameter tubular handles of satin polished aluminum with an ergonomic design. These handles are embedded into the galvanized steel chassis for extra strength and rigidity. They are standard with high load capacity, 8 inch diameter, solid rubber, non-marking, ball bearing casters. While four wheels are standard, Glaro’s six wheel platform carts (an option on all 40”, 48”, and 60” models) can accommodate a larger load capacity and still provide “pinpoint maneuverability,” allowing the operator to swivel in place, turn in tight places, and navigate on uneven surfaces are available. Only eight inch diameter high performance wheels are available because they are easier to move on any type of surface whether hard or carpeted. The six wheel option allows platform trucks to be pushed or pulled from either end unlike four wheel trucks. The “push and pull” design comes with options for one or two ergonomic handles, providing unparalleled versatility of movement. There are even four different deck coverings to suit every application, including new surfaces that can be easily sanitized by healthcare institutions and are slip resistant. Wrap around bumpers create 360 degrees deck and wall protection. 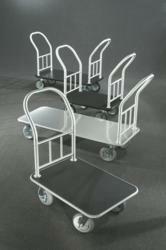 For more information on Glaro Inc. platform trucks and platform carts, please visit www(dot)glaro(dot)com. Glaro Inc. (glaro.com) is a leading USA manufacturer of commercial and consumer aluminum and steel products sold directly to distributors/dealers for almost 70 years. All products ship in 1 to 3 days. Glaro Inc. products are the result of a focus on thoughtful innovation and design. Product lines include bellman carts, platform trucks, trash receptacles, recycling receptacles, smokers’ posts and receptacles, crowd control posts and systems, safety barriers, signs, sign frames, directories, menu display stands, coat hanging equipment, umbrella stands, wet umbrella bag holders, planters, and key drop boxes. A diverse selection of models in 31 finishes is produced in the Hauppauge, New York, plant by skilled Glaro Inc. craftsmen. The company is known for its quality merchandise and its ability to consistently quick ship all products. The customer service department provides unusually prompt personal service and is sensitive to the needs of dealers and distributors.